The GameSparks ActionScript SDK allows you to interact with the GameSparks platform from any ActionScript environment(Flash, Flex, Air etc.) Note: Since the SDK is auto generated from our latest platform builds, all of the Requests/Responses that you see in the Test Harness will be available for use in the SDK. It will also give you full auto complete in your preferred IDE. These instructions will concentrate on how to use the SDK from Adobe Flash Builder. Right click your project and select "Properties". 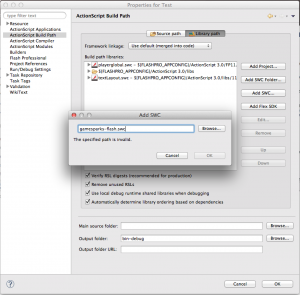 Select "Flex Build Path" or "ActionScript Build Path" (Depending on your project type). Add "gamesparks-as3-sdk.swc" to your library path. All calls to GameSparks are managed through a connection to the server. To create a new connection you can create and initialize a GS object using it's builder methods. We recommend you create a single static instance of the GS object in your game. The API Key to connect to (you can get your games API Key from the Overview page). The API secret of your game. A function that should be called once the SDK has become available. An optional logger for debug messages. The availability callback is a function that takes a single boolean parameter. This function will be called when the SDK connects or disconnects, passing in the connection status when called. Each GS instance has it's own asynchronous message handler, and you can attach a function to each message type you want to handle. To assign a function to a message type, you can use the getMessageHandler() function on GS to get the handler, you can then set the handler for a specific type. When calling send, you can optionally supply a callback that will be invoked when the response is received from the server. This function should take a single parameter of the response type you are expecting from the request.